Sunset on the Fields, a gorgeous, cheerful, and relaxing painting by Vincent van Gogh, turned out to be great for hands-on explorations of light and shadows. 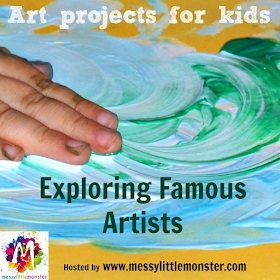 Small child's previous experiences and feelings are there to admire the artwork and support this art project. We tried to stick to an easy painting technique throughout this project: short brush strokes, or just dabbing the brush (pictured below). We concentrated on playing with light and dark colors, and the feelings we might have at the end of the day with the diminishing sunlight and shadows spreading out. The goal of our art appreciation discussion was to discover the intricate play of light and shadows at the end of the day. What can we see in this picture? The sun is almost down, but the farmer is sill working hard on the fields. He is sowing the seeds, he is a sower. Why does the sower have to work so late in the evening? What might he think about? 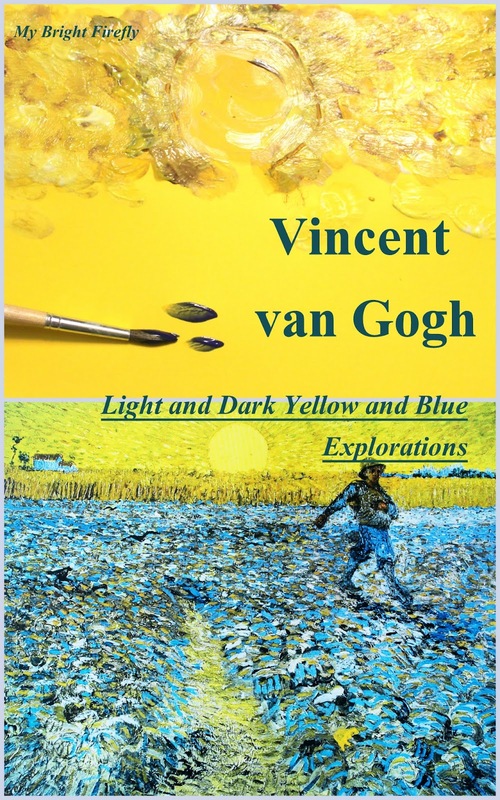 Vincent van Gogh admired the colors he saw at the sunset on the fields. He wanted to make beautiful paintings using all the shades of colors he could notice when observing the glittering sun filling the sky and the fields. What colors can you see here? paper plates for mixing colors. We started by reviewing two spaces: yellow glittering sun above the line and farmer's field below the line. The sky was painted first. My Firefly drew a circle for the sun and traced it with brown paint. We allowed brown to dry while we discussed the shades of yellow and played with mixing colors on the plate. Since the paper is already yellow, we needed to make lighter and darker shades than the color of the paper. The sunrays were painted by dabbing the brush or short strokes using brown and starting from the outline of the sun. Then shades of yellow were added. I showed how making short strokes carefully does not mix the colors on paper, but adds layers of paint for the effect of the glittering sun. Several strokes of white and the lightest yellow were added at the end. We scratched the sun with the other end of the brush to let the brown outline show through. Then we outlined the inside of the sun with the brush to smooth the imperfections. The fields were painted in a similar manner. The colors we used for mixing: blue, black, and white. We talked about the negative space left and tried to fill it with colors (letting the yellow of the paper to pick through). The effects of the light and shadows is achieved. Considering the age of the painter, oh, this is an amazing painting, a last "Good night!" to everything in the nature. Well, I used this to point out how important the good night sleep is and how important it is to go to bed in time. 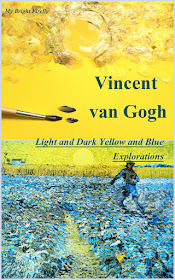 This article is a part of "Exploring Famous Artists" series. 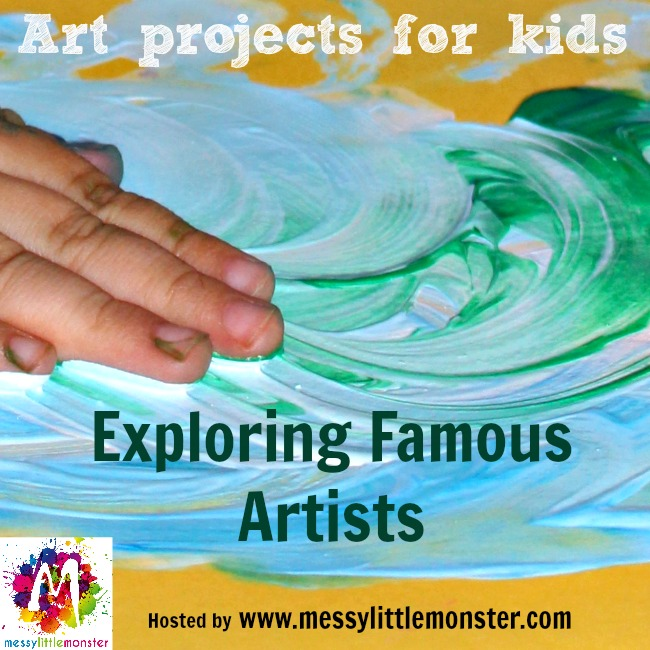 You can find many beautiful art project ideas for kids inspired by famous artists here: Exploring Famous Artists (Series throughout May) by Messy Little Monster.